ACCESS® Roll Up Cover - A Truck Box Cover to Fit Your Lifestyle. The ACCESS® Original Roll-Up Cover is the most asked for tonneau cover! This roll-up tonneau cover gives you the adaptability you need and the sporty look you want. Each tonneau cover is made model specific for the tightest fit. Our truck box covers are available for most Chevy, GMC, Ford, Dodge, Nissan, Mazda and Toyota pickup trucks. 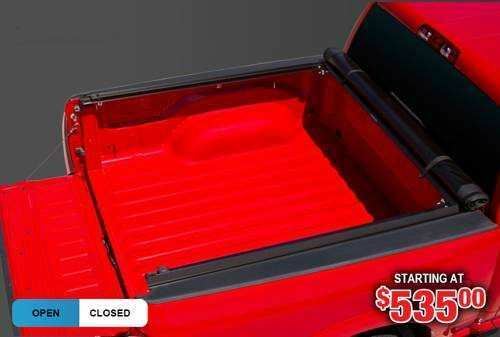 This roll up tonneau cover will be with you for the life of your pick up. The ACCESS® Brand Roll-Up Covers are made to last - that’s why Access® is one of the highest-rated and most popular tonneau covers sold today. ACCESS® is THE ORIGINAL roll up cover, and its unique design has been emulated, but never duplicated. Since 1991, this roll-up cover has earned a reputation for being flawless in terms of ease of installation, durability, sleek looks and price. You simply can’t find a better roll-up tonneau cover! What sets the ACCESS® Roll Up Covers apart from other tonneau covers, is its quality, ease of installation and simple operation. ACCESS® Roll Up Covers can save you up to 10% in gas mileage by reducing aerodynamic drag. We manufacture two types of roll up tonneau covers: Our increased capacity roll up covers gives you additional protected storage, while our low profile roll up covers gives you a sleek, low profile look. *The Slantback Rear Design is a Registered U.S. Trademark of Agri-Cover, Inc.